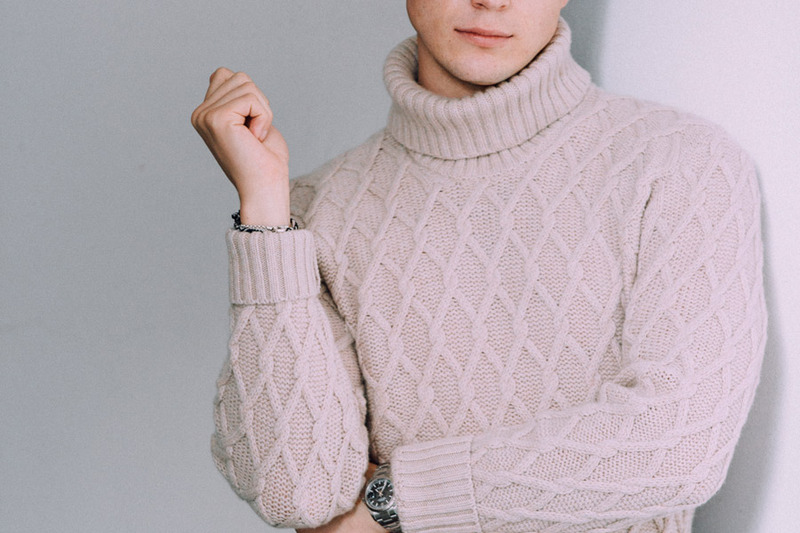 A beige trellis knit roll neck by Inis Meáin. Photograph by Jamie Ferguson. With its distinctive, intricately decorative stitches, the Aran sweater – more commonly known as a fisherman's sweater – has become a sartorial symbol for Ireland, revered as an example of workwear being adopted by broader society. But the decorative cream jumper, popularised by the likes of Steve McQueen, Elvis Presley and Marilyn Monroe, wasn’t commonly worn by actual workingmen. “That garment became stereotyped, and people don’t realise that,” says Tarlach de Blácam, co-founder of knitwear brand Inis Meáin. “They call it a fisherman’s sweater, but in fact, it’s not a fisherman sweater, it’s very much Sunday best – made for little boys and girls for the first communion or confirmation.” What the workers wore was much more subdued, in dark grey, navy or black and in a more restrained design – crew necks knitted with plain stitches. Tarlach started the company with his wife Áine Ní Chonghaile, essentially as an excuse to be able to live permanently on the remote island of Inis Meáin, one of the three rocky isles that make up the Arans, which are off the west coast of Ireland. When they first set up home there in the 1970s, there was no electricity or running water, and the Islanders earned their livelihoods through a modest cottage industry. “We came to write poetry and literature, and we ended up getting involved in community development,” says Tarlach. “We got electricity and water for the island and improved the ferry service, and one of the things we did was set up a little employment scheme, looking around for what kind of natural resources we had, which was very limited.” One of the main assets that the island already had in abundance was knitters – thanks to the tourist trade supplying America with those aforementioned decorative sweaters – and so the duo set about creating the business. A lot of the knits that were already being made and exported used tough wool “more suited to carpets than to sweaters”, and so another point of difference for Inis Meáin was using premium quality fibres – fine wool, cashmere sourced from Italy and alpaca from South America – to create their sweaters. As well as using luxurious fibres, Inis Meáin extends the colours of its garments beyond the traditional grey, navy and black coloured wool. “We’re hugely influenced by the landscape and our surrounds – what we see when we look out the window,” says Tarlach. In terms of design, the team delves into the history of the island to find authentic historical references on which to base its knits. One of the brand’s styles, called the ‘Máirtín Beag Gansey’, is based on a sweater worn by a famous local fisherman. “His wife was a wonderful knitter, and she did it kind of restrained, but always with a flourish,” says Tarlach. Another house style, called the ‘Boat Builder’, is based on a knit worn by a local, and features a plain, ribbed pattern with a roll neck. One source of inspiration was a 100-year-old, holey sweater, which was pulled out of an old hayshed, reproduced and now acts as a collection staple. Beyond sweaters, Inis Meáin also creates jackets, coats and scarves, all based on or inspired by tales of islands. So as a relative Aran knit-expert, is there any truth to the fable that certain families had house knits, in the same way that Scottish clans have house tartans? “I love blowing this myth,” says Tarlach. “There are some that make a big story out of this, that a lot of gullible people are taking hook, line and sinker.” There is, however, some truth to the adage that swept away fisherman could be identified by the distinctive stitches in their knitwear. “One fisherman, in particular, was recognised by the stitch that his mother or his sister or whoever knitted into the garment that he was wearing when the drowned body was found,” he laments. In fact, famed playwright John Millington Synge – who visited the Aran Islands often – used this folklore as the basis for his work Riders to the Sea. Indeed, the Aran Islands have a rich, poetic heritage to them, which is precisely what Inis Meáin taps into with its range of knits; not only in design, but through the skills that have existed on the isles for generations. And with the brand’s continued success – beyond America, Japan and the markets it has already captured – it will hopefully be able to provide work for generations to come.